Celebrating festivals by wearing masks and disguises has been customary in Europe for many centuries. 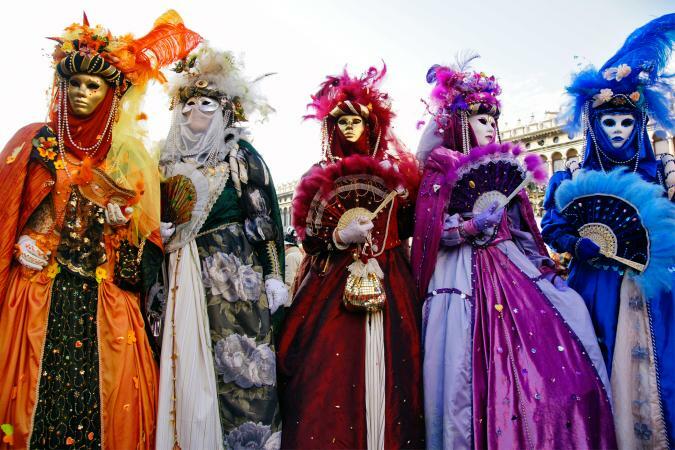 The eighteenth-century masquerade, forerunner of the fancy dress balls and parties of the nineteenth and twentieth centuries, owes its origin to the Venetian pre-Lent Carnival, developed in the seventeenth century. This was a public, open-air event in which all classes participated in dancing, feasting, and practical jokes. The revelers wore masks and either fanciful decorative costumes or all-concealing dark cloaks called dominoes, to enjoy flirtations and intrigue incognito. Masquerading, or masking, was introduced as a public entertainment in London in 1710, held first in theaters and from the 1730s at the public pleasure gardens at Ranelagh and Vauxhall. In 1772, the Pantheon was built in Oxford Street to provide a winter indoor venue. Many masqueraders wore a mask and domino over fashionable evening dress, but others chose very diverse costumes. The dress of the commedia dell'arte characters Harlequin, Columbine, Punchinello, and Pantaloon was popular, as were nuns' and monks' habits (worn with subversive intent) and comic Scotsmen, sailors, and savages. Turkish dress for men and women, admired for its exoticism, appeared frequently at masquerades, and elements of turquerie were adopted in fashionable dress. Most outfits were probably hired, as advertisements show the existence of several London "habit-warehouses" engaged in this trade. The morally questionable masquerade became unfashionable by 1820, but European society's love of fancy dress continued. To accord with the new mood of decorum, fancy balls became the fashion, given either in private houses or as large-scale civic fund-raising events. Masks disappeared, and costumes were based on historical characters (many from Shakespeare's plays or Sir Walter Scott's novels), Turkish and Greek dress inspired by Byron's poems, or the peasant dress of Spain, Italy, and Switzerland. The most admired romantic heroine was Mary, Queen of Scots, whose story combined legendary beauty, doomed love, and a tragic death; her popularity ensured that the "Marie Stuart" cap entered mainstream fashion in the 1830s. Large civic balls were reported in detail in the press, with lists of costumes worn. Many women wore "a fancy dress," meaning fashionable evening dress with fanciful trimmings, particularly feathers. Local dressmakers or even the ballgoer herself created these outfits. Ladies' periodicals, especially The World of Fashion (first published 1828), included plates of historical or foreign dresses for inspiration. For more elaborate costumes and for men's dress, firms specializing in making and hiring fancy costumes advertised widely. London firms (including Nathan's, which still existed in the early 2000s), rented temporary premises in provincial towns where a ball was planned. In France the masquerade was a fashionable way to celebrate state occasions. Louis XV attended the bal masqué at Versailles, celebrating the marriage of the Dauphin in February 1745, as one of a group of topiary trees. From the 1860s onward, fancy dress opportunities multiplied. Society papers listed columns of private balls, often celebrating comings-of-age and housewarmings, as well as public balls hosted by lord mayors, children's parties, and clubs' and works' Christmas parties. Such was the demand for ideas for costumes that women's periodicals, especially The Queen, published regular articles and correspondence columns, and from 1879, books were also available; Ardern Holt, The Queen's columnist, produced Fancy Dresses Described, which ran to six editions by 1896. Popular costumes included "Vandyke" and rococo dress, Japanese dress (inspired by The Mikado, 1885), European peasant dress, and allegorical costumes such as Night, Winter, or Folly. By the 1880s, there was a demand for novel and inventive ideas (such as "The Front Hall" and "Oysters and Champagne"), and originality was important. As well as private dressmakers, the newly established department stores in London and provincial cities made fancy dresses for customers. Queen Victoria's 1897 Diamond Jubilee inspired two of the most lavish fancy dress balls of the century: the Devonshire House Ball given in London by the duchess of Devonshire and attended by royalty and the cream of London society, and the Victorian Era Ball, given in Toronto by the governor general of Canada, Lord Aberdeen, and Lady Aberdeen. At Devonshire House, the guests dressed as famous people from history or fable; the hostess represented Zenobia, queen of Palmyra, and the countess of Warwick was Queen Marie Antoinette. Many of the costumes were couture creations, several by Jean-Philippe Worth (son of Charles). For the Canadian ball, the theme was the British Empire, and many costumes were allegorical: the Aberdeens' daughter represented "The Forests of Canada," and other ballgoers dressed as "Electricity," "Postal Progress," and "Sports and Pastimes." Fancy dress fitted the mood of 1920s party-going perfectly. Young people turned the social world topsy-turvy with all-night parties, jazz, cocktails, and exhibitionist behavior. Masks were reintroduced, and the most admired outfits were outrageous or bizarre, with good taste outof-date. Theme parties became popular: Greek parties, baby parties, Wild West parties, and circus parties were held in London during the 1920s. The commedia dell'arte characters enjoyed a revival, especially Harlequin and Pierrot, given a contemporary twist. 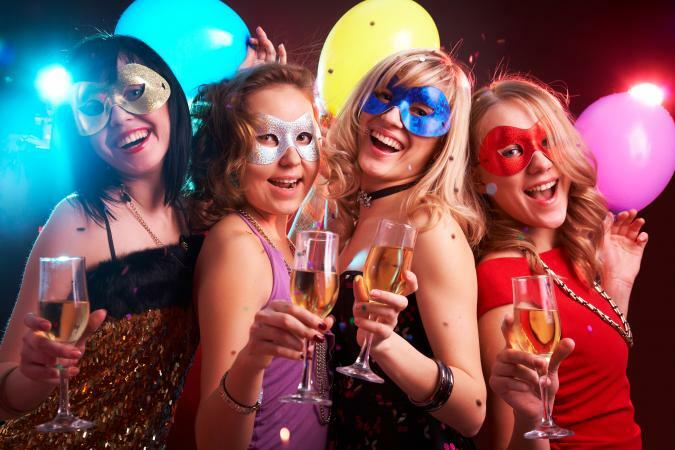 Fancy dress balls became annual events at universities and colleges and a popular feature of holiday cruises. The press called the fancy dress ball given by Carlos de Beistegui, a Mexican millionaire, in the Palazzo Labia, Venice, in September 1951, the "Party of the Twentieth Century." The cream of international society dressed in sumptuous eighteenth-century costumes, many by French and Italian couturiers. In decline since the 1950s, fancy dress returned to fashion from the 1980s. Favorite characters in the 2000s include perennials such as monks, nuns, clowns, devils, joined by topical characters from films and TV. Themed parties are popular; Prince William of Wales celebrated his twenty-first birthday in June 2003 with an "Out of Africa" ball at Windsor Castle. "I arrived at the Sutherlands' ball impenetrably disguised as a repulsive baby boy in rompers with a flaxen wig and a ghoulish baby-face mask, then I dashed home and returned as a Sylphide in white tulle with a wreath of gardenias." Nineteenth-century children's costumes, apart from some nursery-rhyme characters, were usually miniature versions of adult dress, reflecting the mother's taste more than the child's. By the 1920s and 1930s, however, with more occasions for fancy dress, including pageants and street carnivals, and wider social participation, children's outfits were enormously varied, based on cartoon characters and cinema heroes, animals, storybook characters, even advertisements. Many were home-made: the paper pattern firm Weldon's produced catalogs of fancy dress patterns, and magazines suggested how to contrive costumes from everyday clothes or household furnishings. In the early twenty-first century, dressing up is part of everyday play for three- to six-year-olds. Outfits are on sale in all toyshops and chain stores, to turn children into princesses, knights, nurses, policemen, Disney characters, or the popular fiction hero Harry Potter. See also Ball Dress; Masquerade and Masked Balls. Cooper, Cynthia. Magnificent Entertainments: Fancy Dress Balls of Canada's Governors General, 1876-1898. New Brunswick, Canada: Goose Lane Editions and Canadian Museum of Civilization, 1997. Finkel, Alicia. "Le Bal Costumé: History and Spectacle in the Court of Queen Victoria." Dress 10 (1984): 64-72. Holt, Ardern. Fancy Dresses Described, or What to Wear at Fancy Balls. 5th ed. London, Debenham and Freebody, 1887, 6th ed., 1896. Jarvis, Anthea. "'There was a Young Man from Bengal … ': The Vogue for Fancy Dress, 1830-1950." Costume 16 (1982): 33-46. Jarvis, Anthea, and Patricia Raine. Fancy Dress. Aylesbury, U.K.: Shire Publications Ltd., 1984. Ribiero, Aileen. "The Exotic Diversion: The Dress Worn at Masquerades in Eighteenth-Century London." Connoisseur (January 1978): 3-13. Stevenson, Sara, and Helen Bennet. Van Dyck in Check Trousers: Fancy Dress in Art and Life, 1700-1900. Edinburgh: Scottish National Portrait Gallery, 1978. Westminster (Duchess of), Loelia. Grace and Favour: The Memoirs of Loelia, Duchess of Westminster. London: Weidenfeld and Nicolson, 1961.